Guest Linda L. (Heid) Maloney had a 20 year military career as a naval flight officer flying the A-7, EA-6A, and the EA-6B Prowler. She was one of the first women to join a combat military flying squadron. Since then, she’s provided engineering and technical support to the Navy’s aviation acquisition programs and has just authored the book, Military Fly Moms ~ Sharing Memories, Building Legacies, Inspiring Hope. We talk with Linda about being a female military aviator, and the time she had to eject from her plane. In her book, a collection of women military pilots tell their stories, the decisions they have had to make, the legacy they want pass down to their children, and the encouragement they give to other women. A portion of the proceeds from the book go to Girls With Wings. Find Linda (and her book) at www.LindaHeidMaloney.com or on Twitter as @militaryflymoms. Also see the Military Fly Moms ~ Sharing Memories, Building Legacies, Inspiring Hope Facebook page. 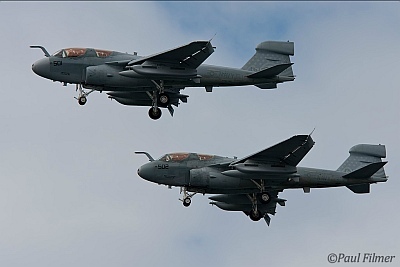 David’s Aircraft of the Week: The EA-6A Electric Intruder. In addition to the airshow noise, Grant and Steve talk about CASA grounding another animal themed airline, Qantas considering laying off 400 maintenance workers in Melbourne, Qantas delaying two A380s but increasing domestic capacity to fight off Virgin Australia and the recent Australian decision to delay making a decision on when to purchase the F35. This week on Across the Pond, Pieter again talks with UK airline consultant Tim Gresty from Cognitio. Tim shares more of his views on the way the industry is developing and where he thinks things will develop for some of the carriers. Martin Baker, maker of ejection seats. This entry was posted in Episodes and tagged Air France, Aircraft carrier, Book, Delta Air Lines, EA-6, ejection seat, F-22, Flight 447, Fuel Costs, Navy on May 8, 2012 by maxflight. I look forward to your podcast. Listen on Sticher. Enjoyed Linda Mahoney’s stories. Wish she had been further from the mic or phone. Got a chuckle about the ‘unmanned’ comment. I saw a picture of an all woman crew on a C-17. They had changed the name of the ‘cockpit’ to the ‘box office’. Tom: Thanks for the feedback. We had a number of audio problems this episode. We try to bring you the highest possible quality, but sometimes we fall a little short of the perfection we seek. Glad I found your site. I enjoy the podcasts! I will check out the other airplane geek sites!